After a couple of matches in cup action – with varying results – Khalsa return to Midland Football League action on Saturday, travelling to face Coventry United. 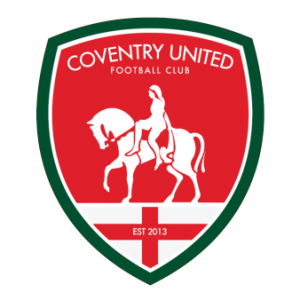 Now in their third season in the MFL, Coventry United only formed in 2013 by a group of disgruntled Coventry City fans not unreasonably perturbed about the club’s temporary move to Northampton. After rapidly rising through the leagues, the club finished seventh and then eighth in the league. United currently sit 12th in the league while Khalsa are fifth. Khalsa’s haul of 27 points is nine more than Cov although they have played a game more. Like Khalsa, United are still in the FA Vase, having most recently dispatched fellow MFLers Boldmere 3-0, just a fortnight after being beaten by the same team in the league. Shaq McDonald (8), Kyle Carey and Curvin Ellis (6) have been banging them in for Coventry who include ex-Coventry City midfielder Kevin Thornton in their ranks. Last season saw Khalsa do the double over United. In January a Craig Bannister wondergoal helped secure a 2-1 win at Butts Park and in November goals by Liam Holt, Craig Bannister and Kyle Brady earned a 3-0 win at the Aspray Arena. United play at Butts Park, also the home of Coventry Rugby. As a result, it’s a brilliant set-up, although the dynamics of the dugouts and passing spectators is a bit on the unusual side and the pitch can suffer a touch at times. But it’s great and is really handy for Coventry station and the city centre. Find out more at the club’s super nifty website or use the map below to get to what should be a cracker. The club is advertising that active and retired armed services personnel to watch this Saturday’s game for free, to mark remembrance weekend.